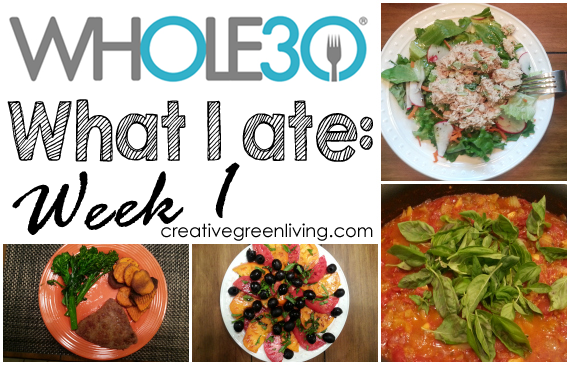 If you're coming late to the party, I started Whole 30 last month and I'm in good company! I have several friends who are Whole 30ing along with me. If you're interested in doing it, too, get started here. Each week I'll be posting about what we ate. Hopefully it will give you an idea of what the program is like and maybe even inspire you with your own food ideas, too! Breakfast: Egg scramble with bell peppers, mushrooms, onions and guacamole. Frozen peaches with coconut milk. Lunch: Small salad with tuna salad leftover from dinner on day 1. Banana. Breakfast: Scramble with 4 eggs, bell pepper, mushrooms, onion, guacamole. Pan roasted herbed potatoes with garlic herb mayo. Lunch: Big salad - lettuce, raddishes, carrots, olives, avocado and grilled chicken. Dinner: Taco meat over salad with fresh pico de gallo and guacamole. Breakfast: Scrambled eggs, avacado, pan roasted baby potatoes, garlic herb mayo. Lunch: Egg salad (chopped eggs, Whole 30 mayo, died celery, onion, basil), scooped and eaten with celery and carrot sticks. For week one, we stopped at Cash and Carry first to pick up some giant bags of onions, mushrooms and ginger. Most of the rest of our food was purchased at Natural Grocers. Some things that Natural Grocers did not have were picked up at New Seasons or Winco. We spent a full day shopping and prepping food like crazy people. While I hated that it took up my whole day, it did make meal prep throughout the week go much faster because everything was pre-chopped or pre-marinated for me. We did not stick to the one HUGE prep day at the beginning of the week pattern after this but I am SO GLAD we did for the first week. Follow Carissa's board Whole 30 on Pinterest.